Why does the music staff have five lines and four spaces ? Brian is right, although for practical purposes we say there are 5 lines and spaces, as he mentions. It is a bit like the visible light spectrum I suppose! We use ledger lines to put these notes on to avoid having a massive music staff. The line through middle C is probably the most famous ledger line! Having had some time away from the site I am back to building it again now, and on this basis the first new page I am going to build is going to be about ledger lines! The stave isn't 5 lines; the staffs you see in music scores are just convenient snapshots of a much bigger, continuous stave comprising many lines covering the note ranges of the lowest voiced instruments - double bassoon - to the highest, the piccolo. Staffs could be any size you like but 5 lines is pretty much all you need for voices and for most instruments. Having more than 5 would simply result in many instances where lines were unused. Well, music actually started off being written on a single line. Guido of Arezzo, a Benedictine monk is credited with inventing staff notation. He also invented the Sol-Fa (Doh, Ray, Me) system. It was Ut, Ray, Me initially. Gradually more lines were added to the single line to allow a wider range of notes to be represented. 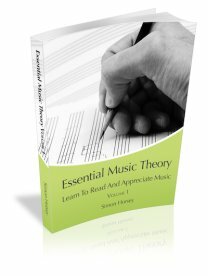 As with many things in Music there is probably practical reasons that we ended up with 5 lines and four spaces such as the general range of instruments at the time, the general vocal range in use and the ability of people to learn and use the system. If you are interested in the history of the music staff there is a great book and TV series by Howard Goodall called Big Bangs that explains not only the history of the staff but several other important events which shaped the course of music history.